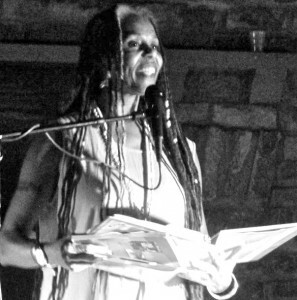 Doris Davenport’s crucial journey as an artist and thinker has spanned many years and has touched the nation (you may for example remember her piece “The Pathology of Racism: A Conversation with Third World Wimmin,” which was included in the groundbreaking anthology This Bridge Called My Back), but her work has also been grounded in the South. In recent years she has been working, writing, and teaching in Georgia and Alabama. Alexis Pauline Gumbs: I love the moment in it’s like this when you say: “I still believe most women can fly.” Me too! Say more! Doris Davenport: Wimmin have the potential to transcend and transform the mundane realities of the – isms’s (including institutionalized, traditional); to rise above others’ limitations, to be pro-active, self-defined, to evolve constantly. Untapped and amazing abilities and powers. A: Speaking of power, it was wonderful to read about your relationship to African spirituality and to benefit from those references and images in your poems. Can you say more about your relationship to African spirituality and its impact on your poetry (and vice versa)? A: What was the hardest poem to write in It’s Like This? What was your hardest poem to write ever? D: In all honesty, i don’t think that writing any of my poems is “hard,” certainly i would not know which is “hardest” because for me, writing poetry is, at some level, ongoing, beloved, “hard” work. That is, i *work* at my poems with constant revisions and updates. True, some poems are “born” more finished than others. A: You clearly have a strong relationship to music…both through your references to musical influences (like Nina Simone) and in the rhythm and musicality of your own poetry. (I was so struck by the poem “metronome”). Can you say more about your relationship to music? D: Music is a part of everything i do. When i have a daily regular writing schedule, i chose specific music to work by. When i do class prep, i play music. On the treadmill – music, and years ago, long before it was popular, i recorded my own music (a cassette tape) for exercise. i am *so* grateful for Spotify (and similar contemporary “apps”) so that i can be surrounded by all kinds of music at all times. But then too, i grew up in a household and community that was immersed in music; in a community still wonderfully maintained African “oral expressiveness” aspects. That means, and pre-television too, we all were storytellers, dancers, singers and musicians. We entertained each other. My maternal grandfather and his brother were musicians who travelled around making music on fiddle and banjo. (No, i never heard them, they’d “got religion” and changed up by the time i knew them.) i am a dancer, a performance poet, a music-and-art loving entity. Period. D: Well, that’s just it, isn’t it? (smile) All these elements have an intricate and inextricable relationship, all influencing each other. My earliest art from, for instance, was visual art; i sketched and painted nature scenes, the woods, even houses (not so much people). i still keep art supplies around, just in case / and many of my poems, especially the Haiku, are word drawings and paintings. i am a poet and i “intellectually pursue” (and spiritually, and joyfully) the works of other poets, particularly wimmin poets, as i did in my Ph.D. dissertation (Sherley Anne Williams, Audre Lorde, June Jordan and Lucille Clifton), and as i do in “scholarly papers / presentations” at The College Language Association (CLA) each year. A: In the new preface to it’s like this, you mention being a time traveller. I too am a time traveller (and space cadet). What are your time traveling tools? D: Temporal-spatial alternate realities in the same room as “inhabited” by each person’s mind / spirit, is one possibility of time traveling. A sense of walking with ancestors, of literally feeling their energy and presence with me, is another form. To engage, even minutely, in the (via QiJong) Energy of the Universe, another one still. But one thing i mean for sure, for me, is the “travel” among alternate realities, identities, roles. To me, the ultra-straight reality of (presumed normative, un-questioned) compulsory heterosexuality, with its accompanying male-defined parameters, is an alternate or parallel “reality.” On another level, time travel for me means access to multiple levels of *memories* simply because i am almost 65 years old – a very rich age. Having lived so variously and in so many multiplicitous ways, and having vivid memories, i “travel” among those memories, my thoughts my thinking even as i exist in the present’s present time. And i have my journals of 40 years or more . . . they often read like syfy certainly, some of the past lives are alternate states of being. A: Right. Sci-fi selves! And you mention Octavia Butler in your preface. Can you talk about your relationship to speculative/science fiction and also the lessons that you feel Octavia Butler’s work has for those of us living in this time? 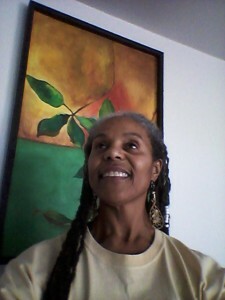 doris davenport is a writer, educator, and literary & performance poet who grew up in the Appalachian foothills of Habersham County (Cornelia), Georgia. She has earned degrees from Paine College (BA English), State University of Buffalo (SUNY), New York (MA English), and the University of Southern California (PhD Literature). She is the author of eight collections of poetry, most recently, ascent (2011). davenport is available for lectures, workshops, readings, performances, and collaborations: zorahpoet7@gmail.com. Don’t forget to read it’s like this at http://www.lesbianpoetryarchive.org/itslikethis and spread the word!! !